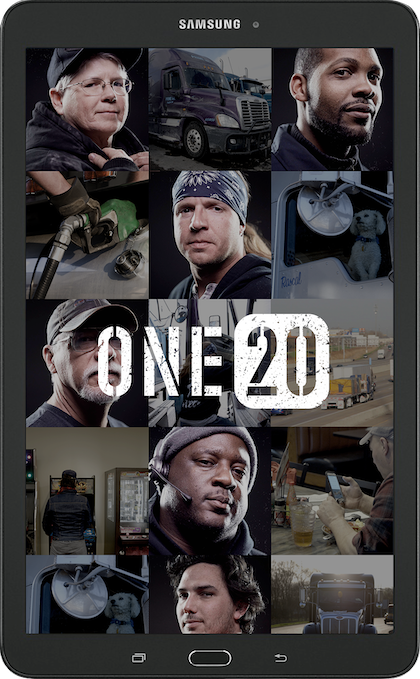 Trucker-focused app maker One20 concluded in a recent study that less than half of truck drivers using One20’s service still have not switched to an electronic logging device, though the compliance date is still more than six months away. One20’s Vice President of Marketing Amanda Ford says 57 percent of drivers surveyed don’t use electronic logging devices, and that number jumps to 60 percent with drivers over the age of 45. While Ford says she believes more drivers will begin to comply as the Dec. 18 compliance date nears, she says cost and ease of implementation seem to be holding some drivers back. One20 in March introduced its own ELD at the Mid-America Trucking Show — the F-ELD, a “bring-your-own-device” ELD. In its TopOne20 report released last week, the company outlined the best and worst of life on the road for truckers, along with how drivers spend their time and money when on the road. More than 3,000 drivers participated in the study, and Ford says the analytics from the study correlate well with other data collected from the 250,000-plus drivers that use One20’s app. In addition to the information collected about ELDs and technology, the study also polled truckers on their favorite truck stop chains and restaurants. TA and Petro truck stops were the preferred travel center chain based on parking, clean facilities and good restaurants. Subway restaurants were voted the best quick-serve restaurant, while Iron Skillet was voted best sit-down restaurant by the surveyed truckers. One20 plans to release additional reports quarterly, with the next one coming in July. This entry was posted in Trucking News and tagged ELD, Technology, trucking on May 31, 2017 by ReedTMS. What’s the Top Issue Facing the Trucking Industry in 2017? The ELD mandate was the number-one issue on everybody’s mind in 2016 – not surprising, as we’re now only one year away from enforcement of mandatory electronic logging devices in every truck built since the year 2000. The ATRI conducts this survey every year, and the 2016 edition had one new entry in the top 10: The cumulative economic impacts of regulations. That came in at number 3, behind the ELD mandate and Hours of Service rules, both of which also just happen to be regulatory concerns. The new entry bumped driver health and wellness out of the top 10. Truck parking jumped up two spots from the previous year’s list, and the ATRI recently completed an in-depth case study of truck parking shortages. The study focused on times when the demand for parking was highest — evenings and early mornings on weekdays — and observed that drivers who used ELDs tended to spend more time looking for parking than drivers who did not. In other words, the ELD mandate could make the parking problem worse. The ATRI parking study included some recommendations. Some examples are more flexible appointments with shippers/receivers, drivers shifting their hours of operation, and carriers paying their drivers’ registration fees when they use parking reservation systems. This entry was posted in Trucking News and tagged ELD Mandate, trucking on May 22, 2017 by ReedTMS. Will Autonomous Ships Be Great ? Doing away with sailors will make the high seas safer and cleaner. It sounds like a ghost story: A huge cargo vessel sails up and down the Norwegian coast, silently going about its business, without a captain or crew in sight. But if all goes as planned, it’s actually the future of shipping. Last week, Kongsberg Gruppen ASA, a Norwegian maritime technology firm, and Yara ASA, a fertilizer manufacturer, announced a partnership to build the world’s first fully autonomous cargo containership. Manned voyages will start in 2018, and in 2020 the Yara Birkeland will set sail all on its own. It’s the beginning of a revolution that should transform one of the world’s oldest and most conservative industries — and make global shipping safer, faster and cleaner than ever. The commercial rationale for autonomous shims has long been clear. The U.S. Coast Guard has estimated that human error accounts for up to 96% of all marine casualties. A recent surge in piracy is a grim reminder that crews remain vulnerable (and valuable) targets for international criminals. Perhaps unsurprisingly, the industry is facing a chronic shortage of skilled workers who want a career at sea. By one consultant’s estimate, moreover, carrying sailors accounts for 44% of a ship’s costs. That’s not just salaries: Crew quarters, air-conditioning units, a bridge (which typically requires heavy ballast to ensure a ship’s balance) and other amenities take up weight and space that otherwise might be used for cargo. And that dead weight contributes to a bigger problem: Maritime shipping accounts for about 2.5% of global greenhouse gas emissions. All this explains why eliminating a crew and its costs has been a longtime goal for companies and governments around the world. The most advanced effort so far has come from Rolls-Royce Holdings, which rolled out a virtual reality prototype of an autonomous ship in 2014. According to the company, the ship will be 5% lighter, and burn up to 15% less fuel, than a comparable vessel with humans aboard. That effort has been the subject of considerable skepticism — especially from seafarer unions who doubt that technology can replace experienced sailors, and note that the International Maritime Organization, the United Nations agency that oversees shipping, prohibits crewless operations. But what seemed impossible three years ago quickly is becoming reality. Most of the sensor technology for autonomous ships now is commercially available, and crucial collision-avoidance tools have been around in various forms since the early 1990s. The Yara Birkeland is a modest but important step forward. Although it can be operated remotely by a pilot, it will be able to cruise on its own, using an array of sensors, cameras and navigation tools guided by sophisticated algorithms. Back on shore, an operations center will monitor its progress. When it launches next year, with a fully electric power plant, the ship will transport fertilizer from Yara’s factory to ports about 16 miles away, thereby replacing 40,000 shipments a year that once had been carried by polluting diesel trucks. That short route will give the ship’s owners — along with regulators and other autonomous shipping aspirants — a first chance to see such a vessel in operation. Such trips may soon become routine. Norway has designated the waters off of Trondheim as a test site for autonomous ships of all kinds, from container vessels to tugs. Earlier this year, Rolls-Royce announced that it expects autonomous containerships in international waters within 15 years. Other groups are working to do it sooner: One U.K. organization plans to have a solar-powered autonomous research vessel cross the Atlantic in 2019. Lloyd’s Register, the 250-year-old ship-classification group, already has issued guidance for crewless operations. All this could potentially have enormous benefits for the shipping industry. Vast amounts of real-time data from the ships will allow fleet owners to optimize their routes — and profits — based on factors such as maintenance schedules, weather patterns, fuel prices and cargoes. Eventually, fleet owners might find themselves competing with the likes of Amazon.com and Alibaba Group Holding Ltd. — major shippers with the big data operations and deep pockets necessary to integrate autonomous ships into their logistics operations. For those companies, “all hands on deck” already means fingers on a keyboard or a joystick. Within a decade or two, the maritime shipping industry may well be thinking the same way. This entry was posted in Automation, Trucking News and tagged 3pl shipping, Autonomous, logistics on May 18, 2017 by ReedTMS.